Exclusive review: The best third-party Xbox controller? It may be emblazoned with the kind of hideous snake print you see old metallers rocking on those misconceived faux-tattoo shirts, but the Onza is a seriously cool piece of gaming kit (and the snake is Razer's logo, so I guess we can cut it some slack). A USB Xbox 360 controller that can also be used for PC gaming, the Onza TE is optimised for those who take their virtual shooting a bit more seriously than their mothers would like. Rubberised and with a more straightened form to improve grip - which it most definitely does - initial fears of tacky teen-focused design (there are more snake stickers in the box if you're not sated, and what could be the slick-looking black AK-47 of gaming has too many light-up buttons and green detail for our liking) are allayed as soon as you boot up a game. This is a wired controller in a wireless world - sure, it's a 15ft braided fibre monstrosity sure to conquer any living room, but it still feels decidedly old school, even if there's something very reassuring in the knowledge that the battery or signal isnt going to cut out mid-multiplayer. 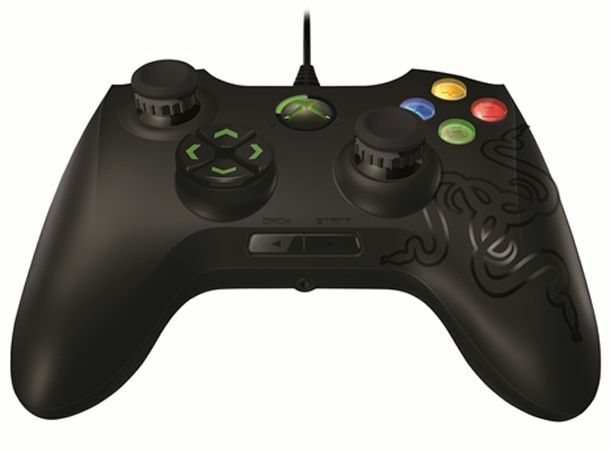 Besides, Microsoft won't let anyone else makes wireless controllers, so Razer didn't really have much choice. Tested during a run of Crysis 2, the action buttons are flat, rather than raised, so the effort needed to pull off rudimentary jumps, crouches and pick-ups is minimal, even if they make a slightly annoying/reassuring clicky sound, depending on your taste. The trigger buttons are more gun-like and firmer, offering more grades of variation and greater levels of control over your wayward gunfire. Although, thankfully, it won't be so wayward anymore, as the killer app is the adjustable resistance analogue sticks, tightened by a deceptively simple dial just underneath the stick's head. Cranked up to 11 (there are no numbers, we just like saying that), control is frankly incredible. The sticks firmly rooted rather than flapping about with the slightest touch, meaning targeted gunfire can be maintained almost effortlessly, streamlining your efforts. It undoubtedly makes first person shooters a much more tactile, enjoyable experience - we favoured a fairly loose left stick for quick movement and an ultra tight right stick for focused aiming. Razer is also very proud of its two multi-function buttons that can double-up any button on the pad thanks to small, easy-to-set remap buttons on the reverse. It's a nice touch, but these buttons sit on the shoulders a little too snugly to the original shoulder buttons (which are now, in turn, half the size).Really usefully the thumbstick presses can alsobe mapped to the shoulder buttons although it's not immediately obvious how this is done. The D-pad is the most unorthodox change, and the clearest indication that this is primarily for shooters. Razer has turned Microsoft's maligned circular effort into an interpretation of the classic four triangles that is so tight to be redundant for anything other than weapon and mission selection. For this it works very well, each button with a clearly marked directional arrow for recognition, but try to control the action (we experimented with FIFA 11 and Sonic 2 on XBLA just to be sure) with it at your peril. This is the best third party controller we've played on the Xbox 360. The analogue sticks are a revelation and with added customisation on offer and a much better grip, it's a definite experience upgrade on the standard controller. However, it's not flawless - the lack of wireless, however unavoidable, can be a pain, not all the design tweaks quite work and it's almost twice the price of a first-party controller. For shooters, we'd definitely advise paying the premium, you will notice immediate improvements, but if you prefer other genres, it's perhaps not essential, though still recommended.